1. What is heat pump dryer machine? Heat pump dryer machine means use heat pump to heat air to dry different goods. 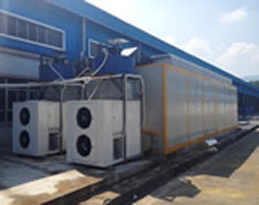 Heat pump is the circulate machine to collect the heat from low temperature heat source and transfer to high temperature heat source through process of compressor working. And heat pump is energysave electric machine and now popular more for heat pump water heater. Heat pump dryer machine is revolutionary change to use heat pump to work for heating air in dayroom. The work principle for heat pump is same as compressor work for antifreeze ( mix R417) to have heat transfer process. Use heat pump dryer machine can make Max 85 degree hot air and also can save 80% more dry cost. 2. How to compare solar dryer and heat pump dryer ? Solar is popular and easy to understand as use solar power to heat air. Solar dryer is user solar air collector ( similar like solar water collector to heat water ) to collect heat from sunshine to heat air and use heat air to circulate into dayroom to heat different goods. Solar dryer is clean and new-energy, 100% free and can use everywhere and every day only with sunshine. But solar dryer efficiency is lower because heat transfer from sunshine should be 40% more or less. And also solar dryer is limited as no solar , no power. Solar dryer usually use for place without electricity like some place on Africa, South America, Asia. Some solar commercial dry project need backup power like Gas& oil . Heat pump dryer use electricity for compressor to compress antifreeze to make heat for air. Then heat pump dry can keep resistant work for 24 hours with long time. And compare with electric heater directly, use heat pump can save 80% dry cost and 1􀒓5 rate ( 1kwh electricity for heat pump can make 5kwh heat from electric heater ). Then heat pump should be very perfect for some commercial dry projects for many goods like Mango chips need 8-9 hours resistant dry and tobacco leaf need 7 days resistant dry. 3. How to combine solar + heat pump dryer together. Solar power is free, clean and can use everyday if with sunshine, but can not keep resistant work on night or weak sunshine. If we can combine solar + heat pump dryer as backup power, that should be perfect to have free power and can keep resistant work with less dry cost. Firstly There need space to install solar air collector, but sometime space is also limited . Space need to out of and can have enough sunshine without shadow. Then we usually use roof of dayroom or other place to install flat plate solar collectors. According to space size, we calculate to install how many pieces 2m2 solar air collectors. After we fixed quantity of 2m2 solar air collectors, then we can calculate how many ?kwh as all solar air collectors can supply with standard power with 6 hours sunshine. We know the total Kwh power we need for this dry projects and then we can calculate how more power this project need to keep for 24 hours work and then we can choose right type heat pump dryer as backup power. Pls check the attached photos. Dry different goods need different dry condition as some goods is easy to dry and some need strong dehydration. And also installation place or that is new dayroom or only replace heat pump dryer with original dry room. Then pls talk with engineer from Dryfree to introduce you right type..
5. How to protect your heat pump dryer. Heat pump dryer machine need very less repair or maintenance , but only sensitive for electronic fittings for control system. Pls keep heat pump dry on dry place without damp for electronic parts. And pls assure heat pump dryer need to use to work one time within 6 months if you keep them in stock as no use for them. 6. How to combine solar + heat pump dryer together. We give 3 years quality warranty for compressor,condensator, evaporator, machine, etc. We give 1 year quality warranty for electronic parts . And we give 7 years life warranty and heat pump dryer can use more than 10 years. 7. How to be a distributor. Pls confirm with Dryfree group to talk for details.